Ever want to find new Civil War Campsites ? This CD will do it. 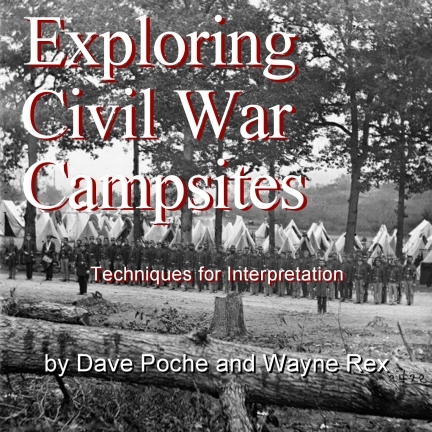 Based on the successful techniques found in "Finding Civil War Campsites in Rural Areas" and "Interpreting History from Relics Found in Rural Civil War Campsites", Dave Poche and Wayne Rex have used the sum of their knowledge to not only find but also systematically capture the history of campsites. This book on CD is intended for everyone from the novice metal detecting hobbyist to the more experienced relic hunter. Dear Mr Poche, My hunting partner and I have been looking for a couple of Union and Confederate campsites and skirmish lines. We both purchased your CD, and used your technique in plotting our last two hunts. After using your techniques, we were able to locate at least two campsites. My partner recovered some minnies, percuscion caps, and pistol shot. I recovered a 1852 (silver) three cent piece in excellent shape. If you want to find and recover more relics, you need to get Mr. Poche's CD.